In dark blends using indigo and burnt sienna, I paint the out line of the angels hair. I wonder if you can see what I mean by angels - just by looking at the pattern? I remember when the piece was first bought, I told the lady who was selling it and suddenly she saw what she'd not seen before. Is it just the creative part of me that sees images where others do not, always? 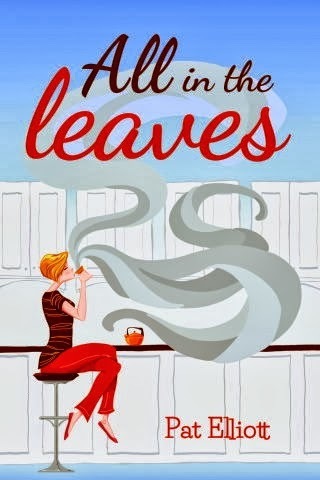 Sometimes I wonder, do you who read see the same way as I do? Here in this stage, I painted the angel hair. Painted in a glorious cobalt turquoise, initially it seems an odd choice, but it fits. 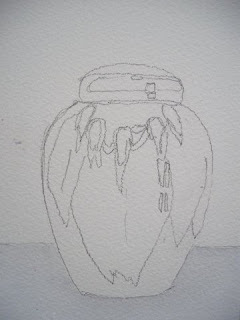 You might think, given what the ginger jar is used for, that this would be a hard piece to paint - but its not. I may be an odd duck! 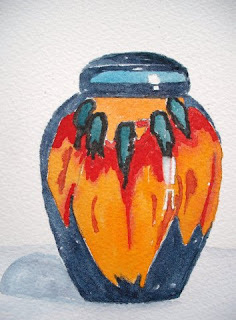 The light just under the lid of the jar has been painted in Winsor Orange. 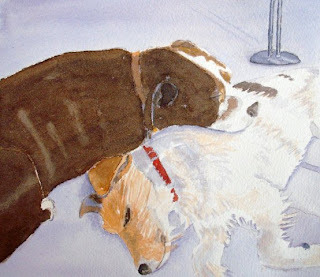 All the paint I use are Winsor and Newton Artist Quality watercolour. 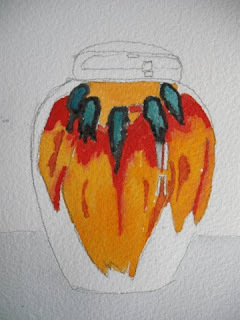 The angel wings have been painted in mixes of orange and cadmium red. 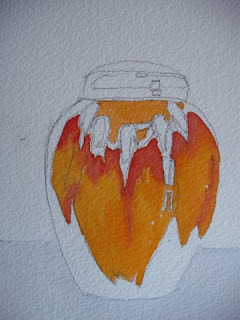 in this stage, I have painted the shelf upon which the ginger jar sits. 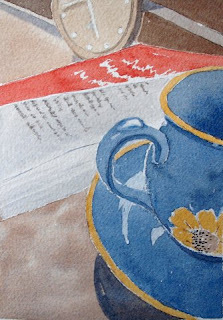 Painted in a mix of ultramarine and crimson, to give a bluey- grey feel . 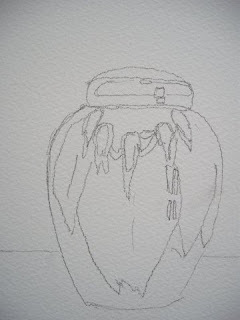 This will set off the jar colours nicely. Nothing to do with the painting, but shelves remind me so much of my Irish auntie, who was always cautioning me not to get "left on the shelf"
I used to answer that "all the best china is left on the shelf - only the mugs get used!" Not something you see so much of now, is it? A cabinet stocked with Sunday best china. I have a beautiful piece of Poole Pottery. 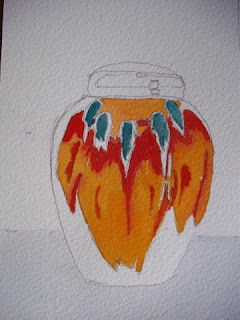 Its a ginger jar, bought to house the ashes of my first dog, Spotty. I fell in love with the design, which reminded me of angels' wings; with the angels gathered round a central light. 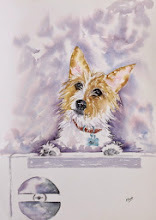 It seemed quite fitting, for I truly believe my little girl is Heaven, with the angels - probably chasing them, as she used to chase the seagulls, just to see them fly! I'm having a day of musing. Recently I've had quite a few people telling me that I should sell my art, to make it a proper business. 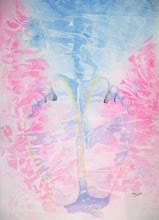 I am self employed and my business is reflexology. I love it with a passion. Art filled my early days whilst I waited for patients to fill my day. Eventually my work day got busier and I had to reserve time for art. Recently, after having many years of being the sole earner, I found myself in the fortunate position of being able to work part-time and spend the rest of my time walking and playing with my dog, painting, reading books and even bake and do the chores -without being in a mad rush. Many people have been kind enough to say I have a talent and should sell my art.. but two part-time businesses? It is a huge compliment that people love my work and want to hang it on their walls - and I am mindful of that, always. 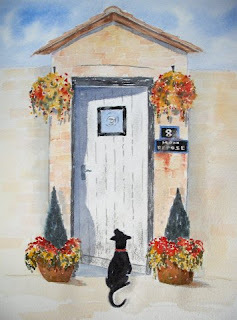 There is so much to think of, the adding of a shop to my gallery site Pat Elliott Paintings, the making of an account with Paypal and a pricing strategy - something I have never had to think seriously about. 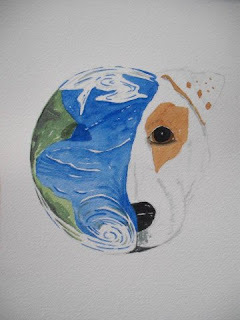 The safe posting of art, UK and worldwide - how do you cope with that? Talking to the Inland Revenue (though they've always been helpful) so that everything is done above board. And then promotion - a time consuming business in itself, as I am sure many artisans could tell you. My biggest fear.. if I painted and it was a business, would painting become a chore or remain a love? 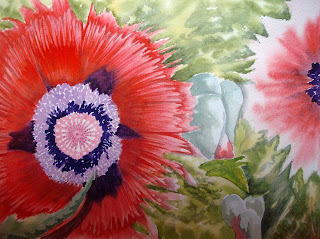 Would I paint only what I chose to paint - as I do now - or would I be driven to paint what sells? I am not sure.. hence the musing..... feel free to add a comment with your perceptions. Perhaps you will make it clearer for me! A dry afternoon and we were out for a walk with our darling girl, in the countryside. We decide to pop in to the local fishkeepers and buy a couple more fish for the tank. 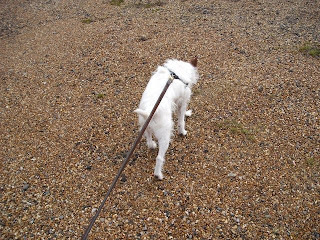 Sadly, dogs are not allowed inside the shop, so Missy and her daddy had to go for a walk in the surrounding land whilst I ventured inside. 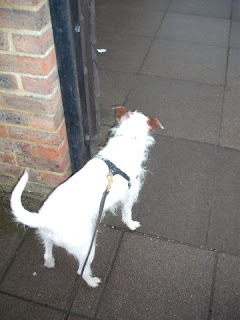 Missy wasn't happy - as I went one way across the car park, hubby walked the other way - but she wanted to be with me! Mummy went this way, daddy; I am tracking her. Why can't I go in this door? She's in here, I know it! Mummy, you won't leave me again, will you? I've painted the darker colouring of Tilly, then proceeded to paint a dark shadow on the left hand side of her body. It leaves the feeling of sunlight striking her beautiful face. Here they are, all finished - the gorgeous couple. Tilly is a gorgeous Staffordshire Bull Terrier, with quite dark colouring, yet an under layer of a light tan. 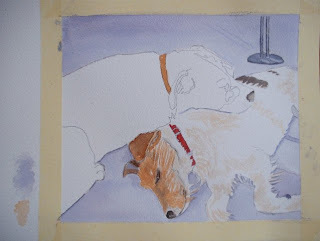 To get the effect of this I firstly paint a light mix of yellow ochre and burnt sienna all over Tilly. This makes her feel more solid to me and I can start to see where I will paint the darker mix and where I will leave some lighter areas showing through. I'm continuing to work on Bryan, getting more definition in, and adding shadows, to make him stand out from the carpet. 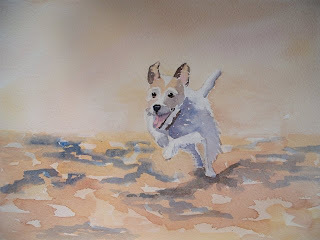 I have painted a few russells now and always use my favourite blends for them, usually a yellow ochre and burnt sienna. The red collar makes him stand out even more, which he'll need to do once the darker Tilly is painted laying across him. 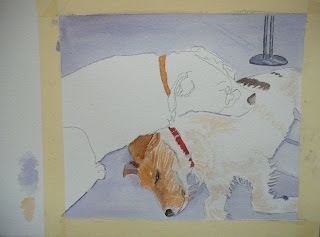 I started painting Bryan first, as of the two dogs he is lying beneath Tilly. 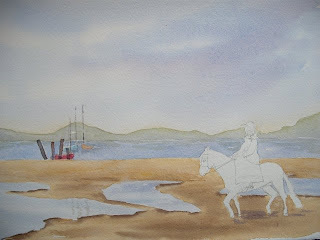 I wanted to make him feel anchored in the painting before I attempted to paint her. 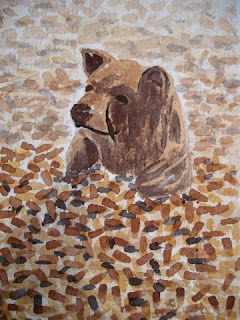 This is quite a different painting from my usual dogs, in that the eyes are not really visible in either. 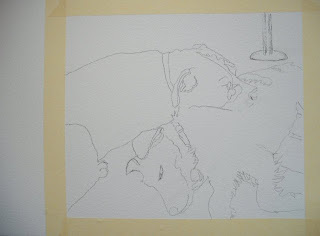 I cannot do my usual method of painting the eyes first to get the feel of the dog - but I enjoy the challenge . You might notice that I have the area for painting masked off by tape. 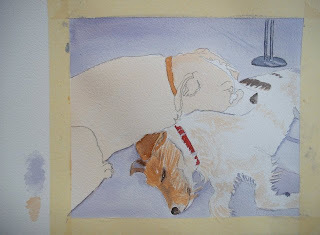 This enables me to use the side portion as a test piece for the colours I mix and also to give me a white border, so that when the painting gets to the framers, they have an edge to work with. None of the painting will get "lost" when the work is mounted. 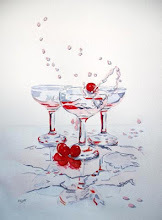 Watercolours have to be mounted and framed under glass so that they do not deteriorate in the elements. 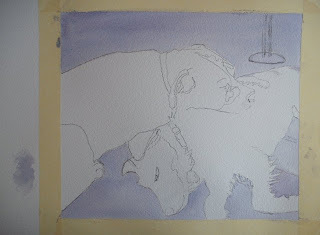 Here I have painted the carpet, in a mix of ultramarine and crimson to make a beautiful lavender background . 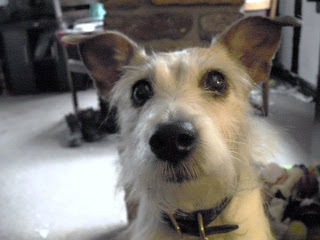 I have a friend in Sarah, who has her own online shop and blog at BuddhistMusician Accessories - and Sarah has two dogs, a Staffordshire called Tilly and a Parson Jack called Bryan. Sarah wanted a portrait of her two darlings, and I wanted an earring and bracelet set, so we arranged a swap. No need to tell anyone what today is..
though if you're interested in history, you can find the history of Saint Valentine's Day here. Whoever you share your day with, I wish you a day blessed with Love. 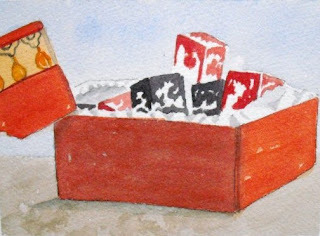 now the box that contains the turkish delight is painted, with a mix of cadmium red and alizarin crimson. This so reminds me of Christmas, which is when we eat turkish delight in our house. 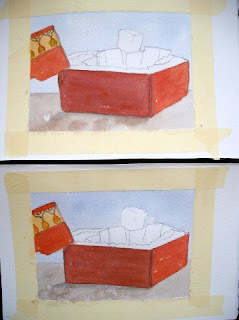 I'm pleased with the paintings so far; from now on, I paint the differences! The sky is painted ultramarine blue - as I would expect it to be on Mount Olympus. Taking my time on these stages gives me more clarity about how I want the finished paintings to look. I remember in art school being told of one painter who used to paint a dozen or so copies by laying them all out and painting all the skies together, then each stage thereafter. I don't think I could do that, two feel odd enough! there are slight variations in each painting. 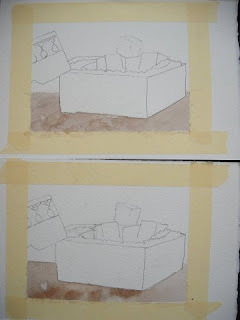 I've never painted two paintings in tandem before, so this is an interesting exercise for me! I have always wondered, if Zeus were in charge, how he would chose for us - sweet delight or endless night? 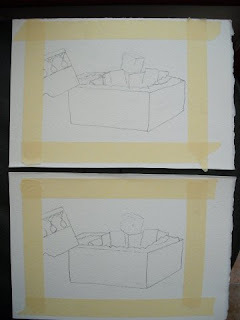 As a painter, I came up with my own idea of how that happened - and not one, but two paintings! I am thrilled to announce that I have received three blog awards (for creativity) from fellow bloggers to date! I haven't had a chance to show them, because I usually programme the blog to publish paintings stage by stage - and that can last a week! I may not publish the awards, but I do thank you for them - and every blog I follow is listed on "My blog List" on the right, which shows the latest 10 updates. Happy blogging to each and every one! 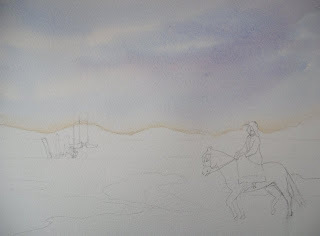 Suddenly, there's an awful lot of this painting completed. 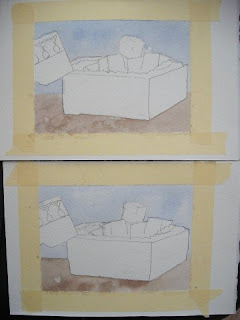 That is because, dear reader, I took it along to my art club, where I don't stop to photograph stages. I go to an art club once a week, for two hours. 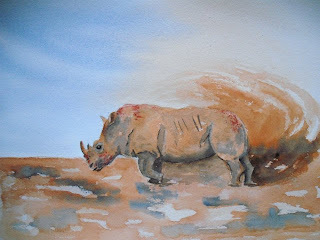 Art can be so solitary, its a welcome event to have like minded company whilst you paint. Every person paints their own picture, though if you are stumped for inspiration, the tutor provides a demonstration piece. 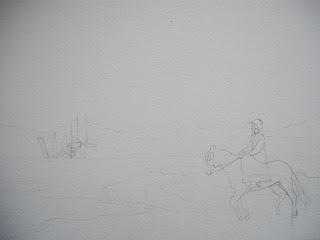 All that is left for me to paint now are the horse and rider. The sky goes in - a lovely broad sweep of colour, suggesting a clear day with a little cloud. Clouds are fascinating - there are many different types, from cirrus to cumulus to stratus. To read about them, click here . What always fascinated me was that when you start to really look, clouds aren't all white .... they have many different colours in them. 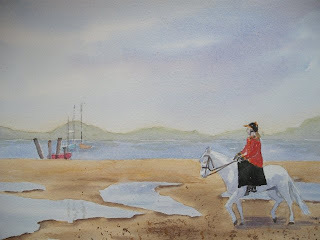 I was trawling through the umpteen photos I keep on the computer - looking for something to catch my eye, so I could paint it. Today it was the turn of a horse and rider, who we originally saw a few years ago, on a fun day out in the country. 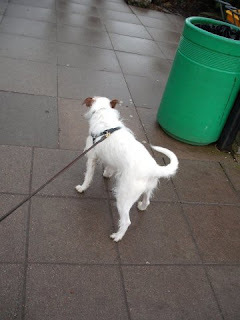 We were taking Missy here, there and everywhere to get her socialised with all different situations and smells, you see ( something you do with an under socialised dog) . This gave me many opportunities for taking photos that I could use as paintings . I have a friend who likes to paint - and every now and then we get together to have a "Painting Day"
On this painting day we like to try out new techniques. Does it delight us as much as the coffee and currant buns we ate? Hmm.. not sure... but one thing is for sure - the painting will last longer than our currant buns did! Sometimes I'm asked where my inspiration comes from - and the truthful answer is " from everywhere!" 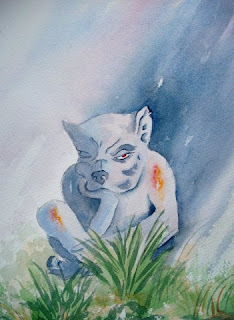 "Change my World - Rescue Me"
and as you've recently seen, one of my garden gargoyles. I am sure most will be familiar with the fairy tale "The Princess and the Pea"
The woman who purports to be a Princess sleeps on a bed with twenty mattresses and twenty feather beds on it - and underneath all those -unbeknown to her- is a pea. 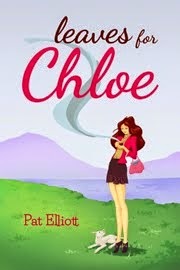 In the morning, she complained of a bad night's sleep due to something in the bed bruising her back. Thus her Prince knew she was a Princess. 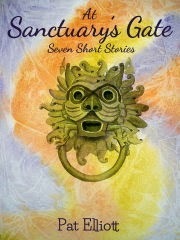 For the history of the tale, click here. 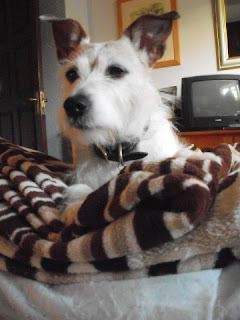 This morning I stripped our bed for laundry, neatly folding the duvet and fleece throws and placing them in a stack on the end of the bed. When I returned a little while later - what did I find? A certain little girl who looked so regal and imperious, she put me in mind of the Princess! I have sharpened up some of the colours to make the whole effect more striking. I'm quite pleased with the finished article. Gordon.. who looked so fed up, I decided to call the painting "The Big Blue"